Sony is going PSP bundle bananas this year, releasing "Entertainment Packs" packaged with Rock Band Unplugged, Hannah Montana: Rock Out the Show and Assassin's Creed. Today we can add one more bundle to the pile. Square Enix's Dissidia Final Fantasy is also getting the Entertainment Pack treatment, bundling the Final Fantasy-themed fighting game with a new "Mystic Silver" PSP, Final Fantasy VII Advent Children on UMD and a 2 gigabyte Memory Stick Pro Duo. Interestingly, this package is a GameStop exclusive. 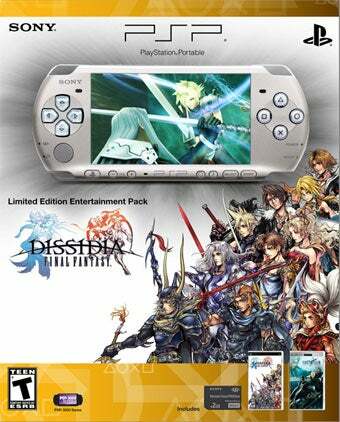 It will set future PSP-3000 owners back $199.99 USD when it ships on August 25th.